Perfect pillows so ordered more. Highly recommend! 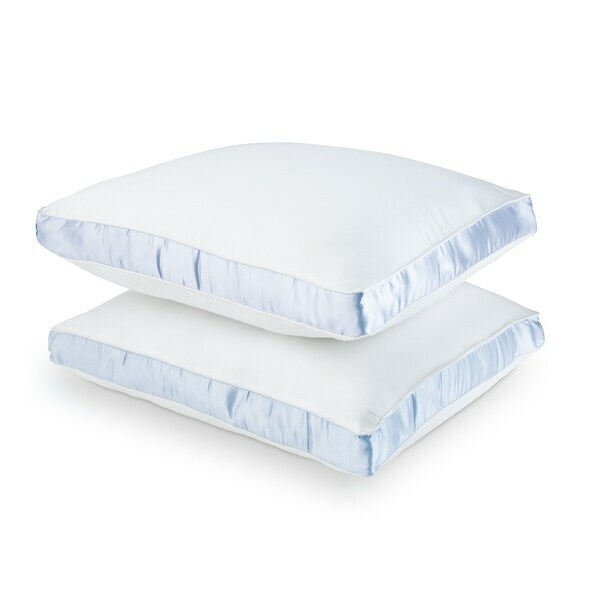 The DOWNLITE firm density pillow set combines comfort with luxury. These firm pillows provide the support you need, so you wake up rested and feeling great. During bedding changes, pop these pillows into the washer and dryer for fast, efficient cleaning. Dimensions 24.0 In. X 18.0 In. X 5.0 In. The pillows have less filling than expected. They are supposed to be firm. Some of the corners are actually empty. I suppose the stuffing might shift to fill the empty spaces, but they won't be firm in that case. I've bought this brand before and did not have this problem. I don't feel like returning, so I think I'll open up an edge and fill up the empty parts with stuffing and then sew them closed. This will fix the problem, but it would be nice if I didn't have to do this. I needed a set of firm pillows for a new set of standard pillow shams in my master bedroom. Although I don't sleep on them (I have a special pillow for side-sleepers), I use them daily to prop up in bed and read or watch TV. So, the pillows get a lot of use and need to be firm, but need to have some "give;" I don't want to feel as if I am leaning up against a stone wall. The Cotton Sateen pillows have been very comfortable thus far. They "spring back" well after use and have not shown any tendency to get matted down; I don't constantly have to get up and "re-fluff" them. So far, I am pleased with my purchase. Overstock shipping was very fast. The quality and product are good, but they are NOT firm pillows, as advertised. I would recommend them to a friend with the explanation that they look and feel like a nice pillow, just not firm. These pillows are NOT the pillows that are pictured. They are not gussetted, they don't say **** (not that that's important) but just would have been nice to see the pillows that they were going to send me and not some much nicer pillows. What you will get are plain white pillows that are not very firm with polyester filling that is pretty much located in the center of the pillow leaving empty corners. I'm keeping them, and using them in shams on my bed only because the price is still pretty good for a set of two pillows. But I wouldn't use them to sleep on, because I'm sure they 1. probably aren't comfortable and 2. wouldn't hold up long with regular use. I was so disappointed the pillow. I don't sleep well and these pillows were not the most expensive on the market, but more then other ones that I have bought. I thought that if I was followed the adage, "you get what you pay for" then these pillows would be a winner. Unfortunately for my sleep patterns, I was wrong. I picked Firm density, thinking that would mean the pillows would not be squishy and certainly would retain their shape. Wrong again. Unless I have suddenly lost my understanding of the English language, these pillows are anything but firm. And poor me, I got a set in medium density because I like 2 pillows but was afraid to use 2 firm pillows, thinking I would get a stiff neck. Wrong again. That' 3 strikes...I'm out! The pillow is firm and comfortable. Excellent price for a set of 2. I bought these pillows strictly as a decorative feature on my bed. I use them to prop up the smaller throw pillows in front to decorate my comforter set which is why I bought the firm density. I have never slept on these pillows but my daughter uses them to take naps once in A while and she thinks they are very comfortable and wants some in her bedroom so that tells me they must be pretty good then! They look very well-made and are filled nicely. I will buy more for my children’s bedrooms, exactly what I wanted! I have been using these Bed Pillows on my bed for over 10 years. I ahve always been happy with them. However the last 2 of them are not like the ones I have had. I Ordered the Firm ones. They are completely different than my previous ones. The stuff they are filled with is different as when I get up in the morning i can see the print of my head on it. They are very soft to the touch, unlike the previous ones. They are nearly 12 inches thick. It is hard for me to make my bed with them on it because they are so thick. I should have sent them back. I am not satisfied with them at all. I Paid more for them than I have ever paid for them before. I Paid about $*** more for 2. They don't look like the picture of them on the page that I am writing this Review. These pillows will not fit any king sized pillow cases that I have, and I have a lot. They are extremely hard to squeeze into the cases. I ordered extra firm. I wanted and expected a harder pillow. These pillows are too light & soft. I go by the description, and this was not my description of extra firm. I'm sorry I bought these. Great support of you like a firm pillow. Nice recovery (doesn't stay mushed together). Great deal for the price. Filled my Croscill Galleria King pillow covers perfectly,....good quality, decent price. I'm pleased. Saw more and less expensive but made a solid call here. Extremely comfortable pillows! They haven't lost their shape and I've had them for a year. 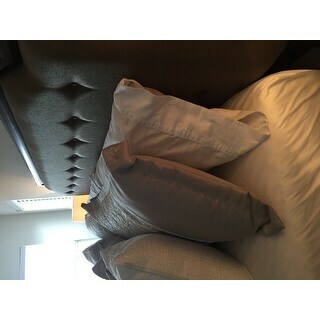 love the firmness of these pillows. Very lofty! Comfortable in every sleep position. SO comfortable. I love these pillows! Very comfortable and firm enough for a good night’s rest. Great pillows. I got them about a year ago and they are still good pillows. Love these pillows! Guests love them. I love these pillows. Light weight and perfect for propping up reading a book. I am thrilled with them. !You will not be disappointed. These pillows are firm, but lost shape rather quickly. Perfect pillow. Outdoes My Pillow hands down! Just awesome. These were firm as discribed and really comfy. This should be a must have, so glad I got these instead of what I initially had in my cart. I’m planning on getting two more. Thanks overstock! These are ok start great and flatten within a few months. "Can I mix the order and get one firm and one med instead of two of the same"
Hello javijay, unfortunately there is no option to do an order of one of each. However, we do offer the medium density under Item #: 16033071 if you want to buy two of each. Sorry for the inconvenience. Thank you for shopping with us!